To learn how just one week spent at Scout summer camp can change a life, look no further than the story of Dylan. Dylan, a 13-year-old Scout from South Carolina, is legally blind. He has mild autism. But that didn’t matter at Camp Durant in North Carolina, where he and the members of Troop 529 spent a week last summer. The staff and Dylan’s troopmates and leaders made sure he had the best week of his life. Dylan’s dad, Andy, shared the story with me, and it’s one that makes you proud to be involved with Scouting. Turns out Dylan tried more new things during one week at summer camp than during any other week in his life. His story proves that special needs aren’t a barrier in Scouting. Any Scout can have the week of his life at summer camp. Here’s how, told as only a proud father can. By Andy Fisher, Assistant Scoutmaster and Dad, Troop 529, Mount Pleasant, S.C.
Dylan and the 20-plus other boys in his troop spent a week running all over Camp Durant: they fired rifles, tried their hands at archery, rode ATVs, bandaged up their friends while earning the First Aid merit badge, paddled all over the lake in kayaks, and gave the largemouth bass a run for their money while earning the Fishing merit badge. They did things they’d never done before. They survived a week without their parents. They ate more candy bars and drank more sodas than they should’ve. And they did well — really well. My son completed something remarkable. He lasted one week away from his comfortable home and from everything he knew. He tried more new things during this one week than during any other single week in his young life. Dylan has mild autism and is legally blind. Fortunately he still has some vision in the leftmost part of his left eye so he could appreciate the beautiful sunny days of camp, but now he is beginning to lose the remaining vision. This week at summer camp was an important growth experience for him and of great value to be there with his friends. The “slower times” at summer camp can be some of the best. Many boys go to summer camp and are driven to earn as many merit badges as possible, to do all the activities they can, and to stay up past 11 o’clock — or later. When I think back to the times in the week that really mattered to Dylan and me, it was not any of those times. The greatest value came from the slower times. Typically later in the afternoon after Dylan had finished his merit badge work he would spend some downtime in the tent. Last summer, The Lego Movie had just come out on digital, so he would quietly listen to the movie on his iPad in his tent. Another adult leader had set up his lawn hammock near our tent. Typically a couple of Dylan’s friends would come up and lie on the hammock and also listen to The Lego Movie, the sound emanating from the tent. As the boys gently rocked on the hammock they would talk about their day, all the fun things they had done and how great it was right then. With the afternoon sun glistening through the trees, they discussed what was going to happen that night during after-dinner activities. Pretty soon, Dylan was out of the tent, right there with them, rocking gently on the hammock. He was asking questions and making funny comments. The world had slowed down to Dylan’s pace, and he was a part of it. The simpler things in life came into focus, and the other boys made time for their friend. Dylan didn’t just receive an award. He earned it. At the Friday night closing campfire, we cheered on numerous awards and short videos showing the highlights of camp. The Ecology department went last with its awards presentation. As the presenter, Josh (Dylan’s Fishing MB counselor), summarized the amazing accomplishments of a mystery Scout who had overcome so many hurdles to earn the merit badge and had cared so deeply for the fish he caught. Josh announced the recipient of the “Super Trooper” award: Dylan. I slowly led Dylan to accept the award, and as we walked along our row of Scouts and down the long steps to the campfire, hundreds of Scouts, leaders and staff started chanting: “Dylan! Dylan! Dylan!” Time stood still. I savored the moment for my son — he was just like all the other boys, receiving an award for something he had accomplished, and he had worked hard for it. A place for everyone at summer camp. What our troop realized from this week of summer camp was that there was a place for everyone, no matter their challenge. To be able to experience an entire week in the outdoors, trying new things and growing as a person is something all boys should experience. 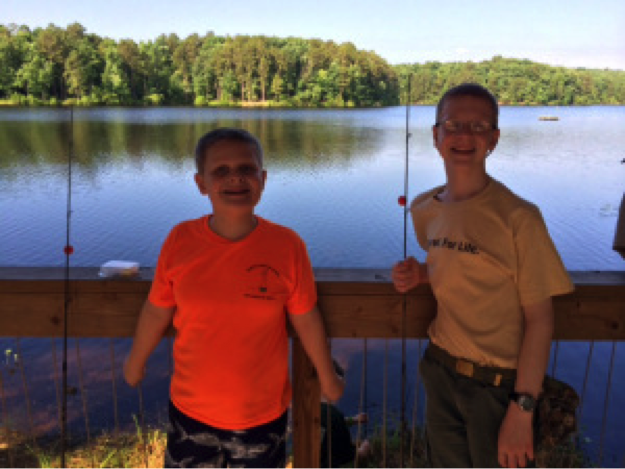 We realized that camp staffs are skilled in supporting boys with disabilities. And, if asked, the staff will do all they can to provide a top-notch program for a boy with special needs. Simple things were possible, such as special accommodations at the waterfront with swimming lessons and opportunities for boating, being able to give one-to-one attention for merit badges, bringing our own tent to provide a safe-haven for downtime during high-anxiety moments, and ensuring that even Scouts with difficult challenges could leave summer camp with patches, awards and accomplishments. Our troop also learned some things we should probably ask for in the future, such as accessible parking for a vehicle in the campsite to more easily transport a Scout around the large camp and requesting special seating up front at camp events so the Scout could better participate and see what was happening. The key: We knew what to ask for and when to ask for help. Reflecting on the ride home. Unfortunately, the week of camp had to end. About 30 minutes into the drive home, I looked in my rearview mirror. My son, Dylan, was sitting between his two friends in the back seat. The boys on either side of him were fast asleep, and Dylan had his head leaned back against the headrest, his eyes forced tightly shut, pretending to sleep just because his friends were. Pretty soon all in the car, except for me, were truly asleep. I thought back to the last day of camp with Dylan. We used a canoe and went out on the lake, father and son. I thought of the gentle splashing of the paddle in the water, the tweeting of the birds in the trees, the warmth in our faces from a week of fresh air, and the total peace in the soul. This was what Scouts was all about … the simple things in life. What great questions and what a great time with my son. This was Boy Scouts. This was Summer camp. And this was an experience of a lifetime that any boy can remember forever. Thank you, Camp Durant. What Dylan’s experience can teach other troops. My son Dylan’s personal experience at Camp Durant is no doubt one of many successful examples of where young Scouts with physical, mental or learning challenges have the opportunity to live just like all their friends. We found the camp staff very accommodating to our requests of support, and in this one week’s experiences, our troop found additional ways to make the camping experience even more special for Dylan next year. We learned that all we have to do is ask for help, and the Scouting community can pull together to provide a lifelong memory for the Scout. If your troop has a Scout with a unique challenge, consult the summer camp you are thinking of attending and ask questions about their experience with such disabilities and what they can do to support. Chances are there are myriad opportunities open to the Scout that will change his life. Andy is an Eagle Scout, originally from Michigan. He has lived in Mount Pleasant, S.C. for 16 years with his wife (Loreen), two sons (Brendan, 15, and Dylan, 13) and daughter (Madison, 7). The entire family is enjoying the Scouting journey of great fun and learning experiences, starting with Cub Scout Pack 505 and now continuing with Troop 529.